Sleep: the Holy Grail for parents of babies and small children. The secret to helping babies to sleep through the night is understanding their sleep cycles and the feeding/sleeping balance. This book provides simple and effective techniques to help parents establish positive sleep habits and tackle sleep problems without feeling under pressure to resort to rigid, inflexible strategies. 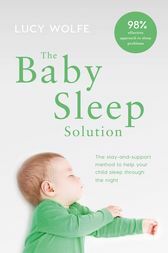 Lucy Wolfe, the Sleep Fixer and Ireland's best-known sleep consultant, has developed a 'stay and support' approach with an emphasis on a child's emotional well-being, which has helped thousands of parents and babies around the world to achieve better sleep, with most parents reporting improvements within the first seven days of implementing the recommendations. Discover the issues that prevent a child from sleeping through the night. Learn about biological sleep rhythms and how feeding can affect them. Create a customised, step-by-step plan to get your baby to sleep. Use Lucy's unique two-fold sleep strategy which combines biological time keeping and gentle support to develop positive sleeping habits.